Hi. I’m Patrick – one of Betty’s three sons. I’m the self-proclaimed “Sous Chef” and author behind the Betty’s Cook Nook blog. While I originally created this site for my family and close friends, I’ve met strangers who found this blog and contacted me – they are now my foodie friends so I thought I better introduce myself and explain a little bit about the origins of Betty’s Cook Nook. I created Betty’s Cook Nook to celebrate the joys of my Mother’s cooking. Regretfully Betty is no longer alive but she’s forever in my heart and I know in the hearts of those who knew her. You can read more about my Mom on our home page and more about her cookbook on this page. Mom loved cooking for our family and friends and I can’t think of a better way to honor her spirit than to share her recipes with folks near and far. Each month I post recipes that I find in hard copy form in her cookbook. I make the recipes one-by-one, photograph them, eat them (my favorite part) and scan the original recipes. In the process I’m converting Mom’s vintage culinary legacy into digital format! It’s a labor of love as it usually takes a few hours or days before each post comes “out of the oven,” as the saying goes. 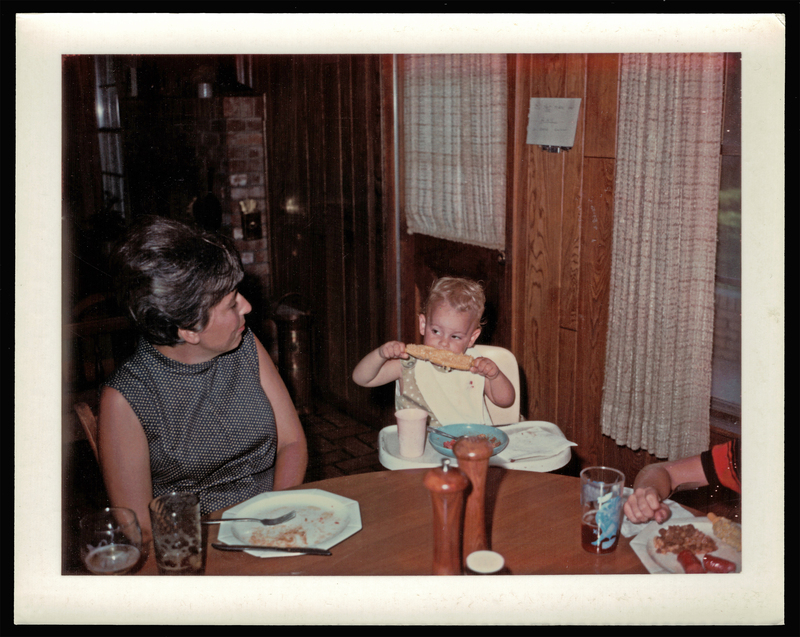 I usually have help from my partner, Joe, who has met my Mom through our mutual love of food. In the process caring and feeding for Betty’s Cook Nook has turned into a mutual hobby of ours since 2011. As you encounter each recipe you’ll likely find old family stories have been intertwined into the recipe posts – a technique I refer to as “nostalgic food blogging.” For me, storytelling and cooking just seem to go hand-in-hand (or hand-to-belly as the case may be). Most recipes here at Betty’s Cook Nook hail from the 1950s-1970s; an era I believe is a unique time when the regularity of the home-cooked family dinner yielded simple pleasures through creating, sharing and bonding. I hope you enjoy Betty’s Cook Nook and that you make a few recipes and share them with your favorite people. Through food, all things are possible. Mom. Me. And Corn. Let The Good Times Roll!